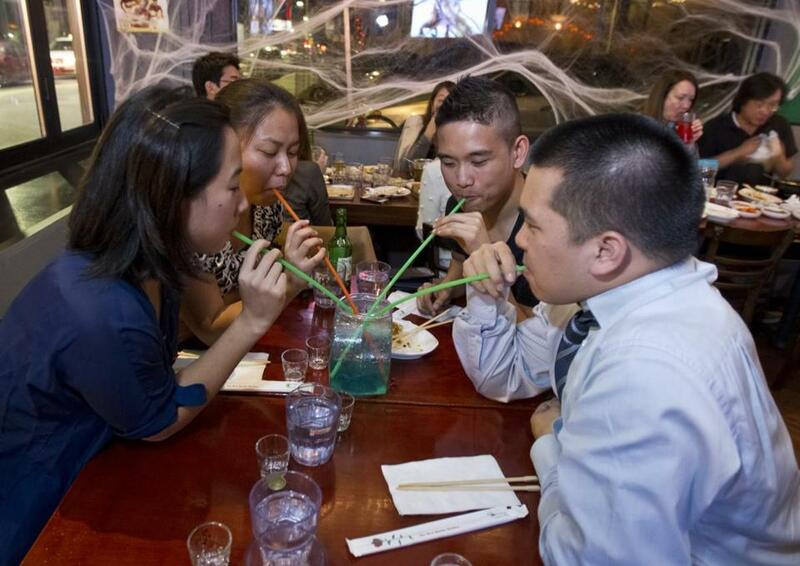 Laura Lee, Margaret Kee, Justin Fang, and Dave Tran sipped a drink at the Myung Dong restaurant. The smells of baked dough and marinara sauce used to dominate Allston Village. But these days, diners might be more likely to catch a whiff of kimchi or bibimbap from one of the growing number of Korean restaurants. 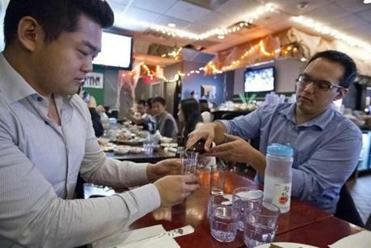 The ready availability of the East Asian cuisine is one reflection of the surge in the number of Korean-owned businesses -- and Korean residents — in Allston. More than one-third of Boston’s Korean population lives in Allston-Brighton, according to recent census figures: About 1,600 residents in Allston and Brighton are of Korean descent — a 54 percent increase from a decade before. They say they are drawn to the neighborhood because of its affordability and proximity to numerous educational institutions. And, as more Korean residents and students have moved in, businesses have followed. “I think now it’s become a destination for anyone who is Korean-American, and for business owners wanting to open a Korean restaurant or market,” said Heather Kim, who opened Douglas Paul Real Estate on Harvard Avenue a year ago. Kim, who moved with her family from South Korea to the United States when she was 7 and who studied at Bentley University, said she chose the location in part because of the growing Korean community, which accounts for a majority of her clientele. Richard Kim (left) observed the Korean tradition of having someone else pour your drink, with Andrew Hubbard. Across from Kim’s offices, Myong Sool Chang moved his business, the Boston Korea weekly newspaper, from Newton to Allston six years ago so the publication would be closer to its readers and sources. The 45-year-old Melrose resident grew up in Seoul before moving to the United States in 1998. “It feels like a second home here,” he said. The change is most evident in Allston Village, which includes parts of Cambridge Street and Brighton, Harvard, and Commonwealth avenues. The section is home to a large number of ethnic groups, including Chinese, Russian, Brazilian, and Indian residents and business owners. “Allston Village is really the most diverse destination for business in the city of Boston,” said Alana Olsen, director of Allston Village Main Streets, a nonprofit organization that partners with the city to provide assistance to local businesses. Of the 264 storefronts in the area,1 in every 10 is Korean-owned, according to Olsen. There are 10 Korean restaurants. When the Bethlehem To Go restaurant opened this summer, it pushed Korean dining establishments ahead of the commercial district’s nine pizza shops. The growing popularity of Korean food was apparent on a recent night at Myung Dong 1st Ave. restaurant and bar. As Korean pop videos lit up large TV screens and music played overhead, customers packed in. Most were college students or young adults. Many were of Korean ancestry, but others were from other Asian backgrounds, white,or black. Richard Kim, the 28-year-old son of Korean immigrants, is vice president for Metro Boston Group, a real estate development company his father founded in Allston. He and friends shared dishes, including a braised pork foot and shank called jokbal, a fried octopus offering called nakji-somyun, and spicy fried chicken. They poured each other Soju, a rice wine, and a light Korean beer called Hite. Andrew Hubbard, 28, said customs that go along with Korean dining can also appeal to people from other cultures. Joon Son, owner/operator of At The Buzzer, sells limited-edition athletic footwear on consignment. While places such as Brookline and Cambridge also have many Korean residents, Allston is becoming the Koreatown of Boston. Andrew Lee, a 26-year-old Brighton resident and Suffolk University Law School student of Korean descent, said he recently visited the area around 32d Street in Manhattan, the heart of “K-Town” in New York City. 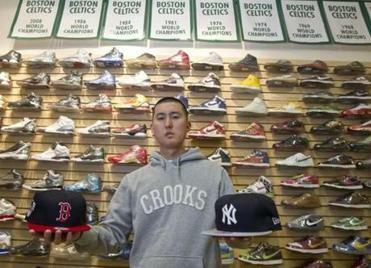 Son, Heather Kim’s brother, owns At The Buzzer, a shop on Harvard Avenue that sells rare sneakers on consignment, along with hats and other apparel. His business is one of several in Allston that is Korean-owned but does not focus on Korean products or concepts. Jennifer Lee and her father co-own Myung Dong 1st Ave., along with one of Allston’s longest-standing Korean restaurants, Buk Kyung II. In September 2011, the 27-year-old Lee opened Refuge Cafe, which serves American-style food. “I think a lot of ethnic restaurants come to Allston because it’s so diverse and welcoming, and all of the business owners look out for each other,” she said. Matt Rocheleau can be reached atmjrochele@gmail.com.